Parties clash over ratification as earlier Panmunjom Declaration awaits parliamentary approval. President Moon Jae-in ratified the Pyongyang Declaration and the inter-Korean military agreement for the implementation of the Panmunjom Declaration on Tuesday after the Cabinet approved the two agreements earlier in the day. The summit agreement will be published in the government gazette for public notice soon, a Cheong Wa Dae official said, while the military agreement will be exchanged with the North before the public notification is made. Cheong Wa Dae spokesperson Kim Eui-kyeom said the exchange of the military document is expected to take place early next week. At the Cabinet meeting, President Moon Jae-in said the ratification of the declaration and the military agreement would facilitate denuclearization of the Korean Peninsula. “Improving inter-Korean relations and easing military tension will make complete denuclearization of the Korean Peninsula easier, and serve as the facilitator (of denuclearization),” Moon said. “(Denuclearization) will not only improve security for our people, but also remove risk factors from the Korean Peninsula and aid our economy,” Moon said. He added that residents of border regions will be the first to feel the positive effects of the easing of inter-Korean tension. 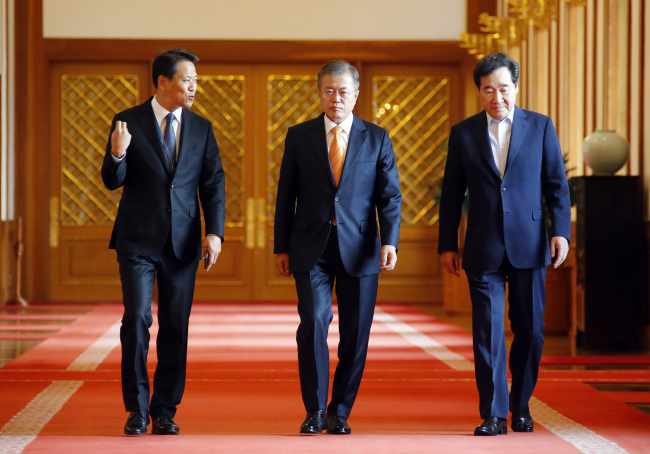 Moon also said that such developments would bring “practical improvements” to human rights conditions in North Korea, and urged concerned ministries to ensure that measures stipulated in the declaration and the military agreement are executed. The Ministry of Government Legislation concluded earlier that the Pyongyang Declaration and military agreement do not require parliamentary approval. According to the ministry, the Pyongyang Declaration is a follow-up implementation document for the Panmunjom Declaration announced after the first summit between Moon and North Korean leader Kim Jong-un on April 27. As the latter has been submitted for ratification by the National Assembly, the ministry deemed it unnecessary for the document on its implementation to go through the same process. The joint Pyongyang Declaration states that the two Koreas will end military hostilities and work toward removing the possibility of war. The declaration also states the two sides will improve relations and seek balanced economic development, and cooperate in resolving issues regarding families separated by the Korean War. It was also stipulated that the two Koreas would cooperate in rolling out “practical measures” for denuclearizing the Korean Peninsula. The military agreement for the implementation of the Panmunjom Declaration states the two sides will end hostilities, cease all exercises aimed at each other and establish a no-fly zone on either side of the border from Nov. 1.